I Went Back to Japan! It’s been a while, hasn’t it? Well, after 14 months, I returned to Japan! But I only stayed for 11 days. You may wonder why I was in Japan. It was for family reasons. My wife’s grandfather passed away, so we attended a ceremony for him. More on that later. I decided to do a vlog series on our visit to Japan. I’ve already done the first three videos, which you can see below. First up is before our flight. Check it out! Next, we’re flying to Japan. I do a lot of talking about our flight and what it’s like to return to Japan after more than a year. As a bonus, my daughter is featured a lot. She’s 5 years old now. And finally, getting reacquainted with everyday Japanese things. We go shopping, we eat out, we take a train. Oh yeah, sushi! More will be coming soon. If you want to keep up with my adventures in Japan, then please subscribe to my channel. I also do book, movie, and TV videos there. If you have anything you’d like to say, let me know in the comments section! It’s been 6 years since the earthquake and a while since I’ve posted here. But I’ve started something new! I’m now running a science channel on YouTube, and my first feature science video is about megathrust earthquakes and the 2011 Tohoku Earthquake and Tsunami. Check it out! If you were in Japan at the time, what are some of your memories of the earthquake? Let me know in the comments section below. Hi everyone! It’s been a while, hasn’t it? Well, I haven’t abandoned this blog. Just been focused so much on my other blog. Plus the fact that I no longer live in Japan has made it more difficult for me to regularly post about Japan. However, I intend on posting here once a week again. To begin, let me reintroduce you to a video series I’m doing called A Taste of Japan. I’ve done several videos in this series already. Here is the most recently published video, all about Enoshima. There will be more than thirty more videos in this series. Please enjoy! As you may have seen, it’s a fairly long video, and may be one of the longest in this series. But I hope you found it informative and interesting. If you have any comments, please leave them in the comments section below! Here’s episode 2 of A Taste of Japan. This time, I attended a festival in Sagamihara called the Ranbu Yosakoi Festival. Great energetic dancing! Please watch the video. Last weekend, during my lunch break, I was able to go to the Ranbu Yosakoi Festival in Sagamihara, Kanagawa. Yosakoi is a type of dance that began in Kochi City in 1954 as a modern alternative to the more traditional Odori dance. This festival is held every year in September. They make plenty of noise! A lot of the music used is quite modern, and the dances are always very energetic. Very fun and uplifting. In case you’re wondering, yes, I did take a video. And here it is. This is episode 2 of A Taste of Japan. Be sure to watch all the way through, because I have a full performance in this video. I’ve begun a new series on my YouTube channel called A Taste of Japan. I’ll be making videos of different events, places, and culture in Japan. This is episode 1 of A Taste of Japan. At the shrine near my home, there’s an annual festival in September that features local dance clubs, cheerleading clubs, a taiko drum club, and singers. In the past, there’ve been professional enka singers, but not this year. I took a few videos, and now, my new series on YouTube has begun. Here is episode 1 of A Taste of Japan. I used Windows Movie Maker, as it appeared the other video editor I was using has informed me I must now buy it. I get roughly the same result with WMM, though. If you have any comments or questions, you know what to do. Oh, and subscribe to my YouTube channel already! Want to Know About Life in Japan? It’s time for some more questions. If you have any questions about what it’s like to live in Japan, please go to this post and ask me anything. I had some great questions before. Let’s have even more great questions! I’ve been running a weekly series about living in Japan since April, and asked you, the reader, to ask me any question about living in Japan. I got some great questions and had nearly three months worth of questions to answer. However, I’ve run out of questions. Now it’s your turn to give me some more questions. If you have any questions about what it’s like to live in Japan, please ask in the comments below. It can be anything. Maybe even just about living in another country, or dealing with different food, culture, language, and so on. You can ask as many questions as you like. So, what would you like to know? Living in Japan for so long, there are a lot of things I really miss about Canada. This is what I wish Japan had. Having lived in Japan for ten years, there are quite a few things from Canada I don’t have access to at all. Occasionally, I’ll be able to eat a real hot dog in Costco, find Marmite in Union, and A&W Root Beer in Carnival, but there are some things that are impossible to find here. This week’s question comes from stomperdad. Besides family, what do you miss about Canada that you wish Japan had? Most of things I miss are food. There are a lot of similar fast food restaurants here, such as McDonald’s, Subway, and Burger King, but what I really want isn’t available here. I always loved going to Harvey’s. The ability to customise your burger is missing from fast food places in Japan. 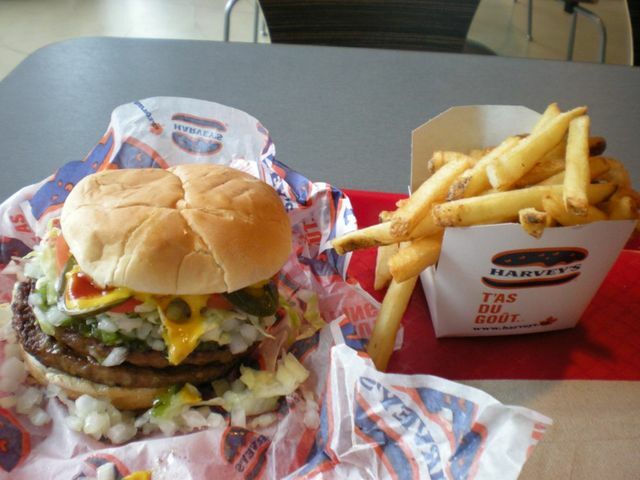 And eating a Harvey’s hamburger was so satisfying. As I See Japan….. from L.A.